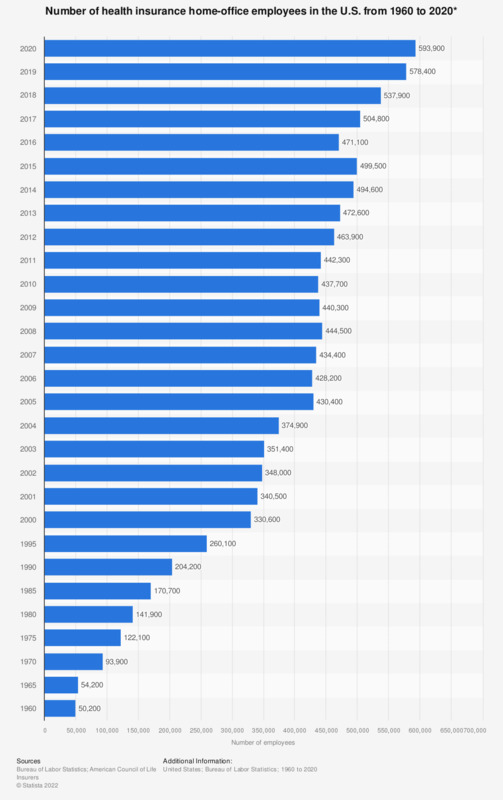 The statistic represents the number of health insurance employees in the United States from 1960 to 2017. In 1999, there were 319,200 health insurance employees (home-office personnel) in the United States. Until 2015, this number increased to almost 500 thousand employees. The number of employees working as home-office personnel in the health insurance sector has risen since the 1990s. In 1996, about 278,000 people were employed in this industry and have increased to roughly 500,000 employees in 2015. Aflac is currently one of the leading health and life insurance companies in the United States. The company garnered profits of 4.6 billion U.S. dollars in 2017. Medicaid is a health care program for families in the United States living on a low income. It is funded by both state and federal governments and managed by individual states. The program was created in 1965 under the Social Security Amendments. Total Medicaid spending in the United States is highest in California and New York, reaching some 83 billion U.S. dollars and 78 billion U.S. dollars, respectively, as of 2015. There were about 12 million Medicaid (and CHIP) enrollees in California and 6.5 million enrollees in New York as of May 2018. The Affordable Care Act (ACA) or “Obamacare” was signed on March 23, 2010 with goals of increasing health insurance quality and affordability to raise the number of people covered by health insurance in the country and lowering health care costs for individuals. It was estimated that the ACA should help insure 13 million more people under Medicaid and CHIP and insure an additional 25 million citizens overall by 2023. Statistic represents home-office personnel. Figures comprise only those on the payroll of insurers that participate in the unemployment insurance program.